Can you see the similarity? 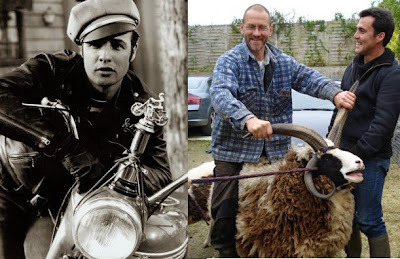 Marlon and his motorbike—me on my moto-mouton. Perhaps my broad grin isn’t as cool as his curled lip and some sort of hat worn at a jaunty angle might help but, hey, I reckon my pure wool seat cover is pretty special. We’ve had an incredibly full day today and so, in order to keep the blog to a readable length, I’ll keep to the sheepy bits. 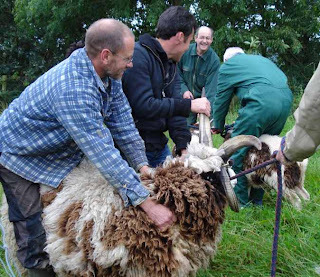 First off was a trip to the veterinary surgeon to have our six-month-old ram castrated before he reaches sexual maturity. He becomes a wether and, as such, we can keep him with our three ewes, including his mum, and our mature ram. Keeping animals correctly, as far as the law is concerned, is quite a complex procedure. We’ve had to register as sheep keepers, and all our sheep have uniquely-numbered ear tags. We have to fill out movement forms when we transport them and, if they’re moved over 60 km / 40 miles (I think) the driver needs to be specially licensed to transport animals. This legislation often seems to aimed at farm-scale production and I wonder that law makers haven’t forgotten that there are other people out there, raising a few animals for their own consumption, meaning that the legislation seems over bearing: a sledgehammer to crack a nut. 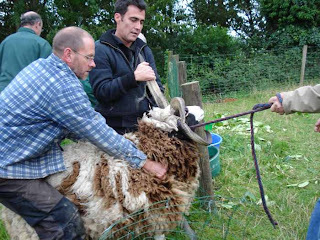 Because our sheep are so small, and there was just one to do, the vet suggested that we bring him to the surgery rather than paying for the vet to come to our permaculture smallholding. We haven’t got a dedicated animal trailer and so, when it came to it, we had to be pragmatic and just make the best of things. 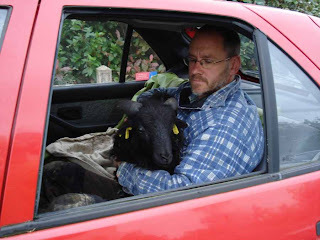 We put a plastic sheet over the rear seat, where I then sat with the ram lamb on my lap, while Gabrielle drove us down to the vet’s. He quickly settled down and seemed to enjoy the scenery moving past at a quicker rate than lamb-running speed, much in the same way that many dogs enjoy a car ride. We did raise a few eyebrows as we passed a group of people, including a farmer in overalls, who saw a right-hand drive car (Gabrielle’s UK car that we’ve re-registered over here) with a blond woman driving and a man sitting in the back seat with a lamb on his lap, looking out the window. 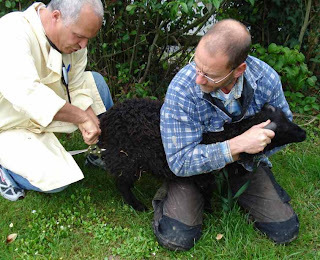 The vet, the very calm and friendly Docteur Mouhli, applied a pair of special pliers to the lambs scrotum, leaving them clamped for a minute each side, which squashes the tubes serving the testicles, a sort of bloodless vasectomy. Dr Mouhli explained that this way he would keep his comportment of a ram (more so than with a surgical removal of the testicles) but be sterile. He assured us that, ram character largely intact, he can still live with the other ram and he may even mount the ewes but not inseminate them. The lamb was completely docile on the journey home and is running around the field again now. Almost as soon as we got home, the phone rang, and it was our neighbours, Jeremie and Marie-Laure, asking for a coup de main (helping hand) with their own sheep, a Jacob ram, ewe and lamb. They, particularly the ram, called Balthazar, are enormous, compared to our little Ouessants. 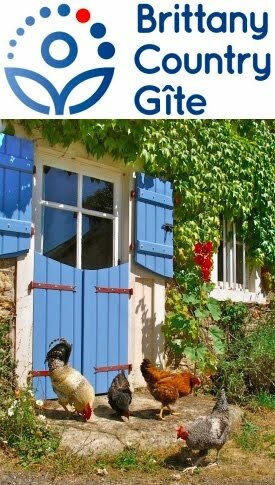 Martine had travelled up from the Mayenne, with her husband, a friend and a horsebox, to take the sheep back to her rare-breed smallholding. The size of Balthazar and his four fearsome horns, was the reason why Jeremie had called in all the help he could get, us and Paul included. The cunning plan—which worked well, up to a point—was to shepherd the trio into the corner of the field, through a cut panel of fencing into a funnel made out of sheep netting when—and here the detail was sketchy—someone would grab hold of the ram, put a rope around him and lead him quietly into the van. Parts 1 and 2 of the plan worked well and I found myself the last one through the cut in the fence and so felt slightly frustrated that I was the opposite end from where it was all happening (I usually like to be in the thick of the action) and just holding the “gate” closed. I needn’t have worried on that score as, eluding several attempts to restrain him, Balthazar then ran straight for me, turned at the last moment and leapt the fence. With lightening reflexes, I saw my chance for glory, leaping fearlessly onto the back of the beast and plunging my hands into his deep wool to get a firm handhold. Help was immediately on hand and all three sheep were walked into the van. Time for coffee, all feeling rather pleased with ourselves. Love the pictures!.......Thought I'd just correct your wording a bit...hope you don't mind. A wether is a castrated ram ........usually ram lambs are castrated during their first week of life by applying a special rubber ring with a set of special pliers......this causes the testicles to shrivel and drop off after about 3 weeks and apart from a few moments discomfort does not bother the lambs. Your ram lamb has had a vasectomy and is now known as a vasectomised ram rather than a wether! He will have all the charecteristics and testosterone of a full ram but will be infertile. He will continue to grow big horns and think he is big and tough, wheras a wether, deprived of testosterone becomes quieter and less'male'in behaviour. Balthazar looks a bit of a handful!! !